2013 marks the 25th anniversary of Canada’s apology and redress to Japanese Canadians for the injustice against them during and after the Second World War. 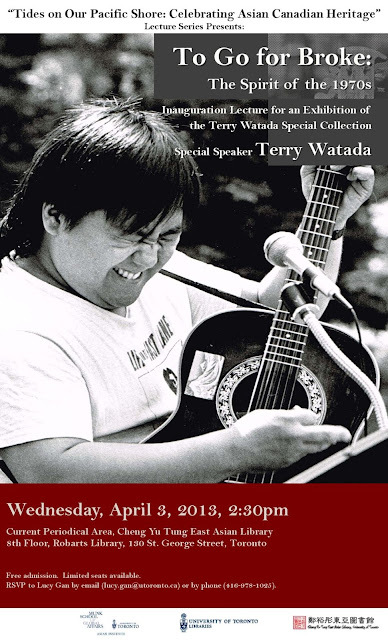 Terry Watada has been personally inspired by and involved in the Japanese Canadian redress movement. In the lecture, he will trace the roots of his writing and artistic work by going into the beginnings of the Asian Canadian Movement of awareness, art and protest in the 1970s, and discuss issues that arose to confront the third generation of Japanese Canadians that led to the redress movement and the flourishing of Asian Canadian art. The lecture will screen parts of two documentary films, Watari Dori (Jesse Nishihata, Montreal, 1973) and Images of the First 100 Years (Powell Street Revue, Vancouver, 1980). The lecture will inaugurate a special exhibition of the Terry Watada Special Collection at the Cheng Yu Tung East Asian Library. Terry Watada is a well-known Japanese Canadian writer, playwright, musician and activist. He has written in a variety of genres that range from fiction and poetry to history and drama. Watada has many titles to his credit, including The TBC: The Toronto Buddhist Church 1995-2010, Kuroshio: The Blood of Foxes, Obon: The Festival of the Dead, Ten Thousand Views of Rain, Seeing the Invisible, Daruma Days, Bukkyo Tozen: A History of Buddhism in Canada, and A Thousand Homes. As a playwright, he has seen seven of his plays achieve mainstage productions, the best known of which might be Vincent, a play about a Toronto family dealing with a schizophrenic son. Vincent was produced at the National Arts Centre in Ottawa as well as the First and the Second Madness and Arts World Festivals, in Toronto, Canada and Muenster, Germany, respectively. In 2012, Mr. Watada donated his personal collection of manuscripts, books, correspondence, photographs and other materials to the Cheng Yu Tung East Asian Library, University of Toronto.